I have passed many times through Koita, a village in the southern part of Mani. On my way to Gerolimano for a meal, to Vathi for a stroll, to the beaches of Marmari for a swim, and further south to Cape Tainaro for a walk to the lighthouse at the southernmost point of the Peloponnese. But in Koita I never stopped. 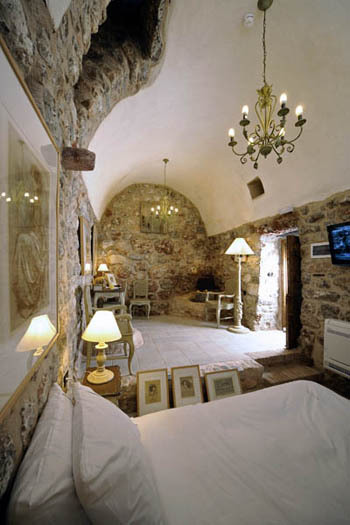 Until I heard about Citta dei Niciliani, 18th century tower house converted into a charming boutique hotel. I stopped and lost all desire to drive on. With only eight rooms, the hotel is a family affair. The property was in ruins when the Sepsas family bought it (in 2006). 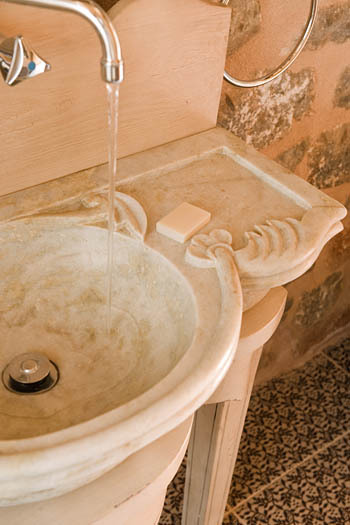 Ilias Sepsas, who is a civil engineer took care of the restoration, and later his wife Tania did the interior decoration. 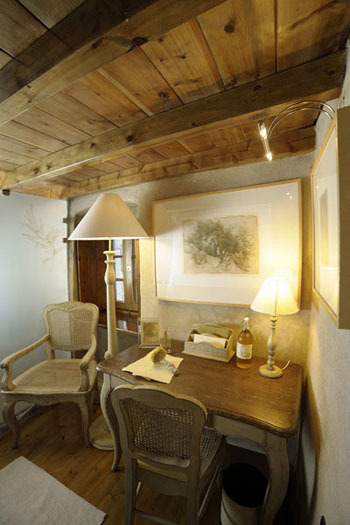 The rooms are done in a beautiful country-chic style and offer sublime comfort. They are perfect for a romantic escape. 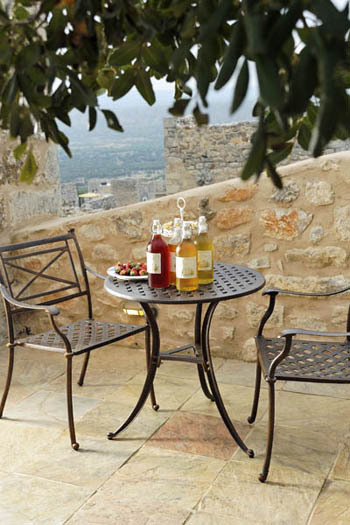 Outside there are terraces where you can enjoy the sun that shines most of the year, and take in the views of tower houses, olive fields and the sea in the distance. Tania and Ilias now run the hotel with the help of their two (grown) children. Originally from Athens, they have embraced country life and go on long walks to collect wild herbs, asparagus, capers, sea fennel and sea salt. 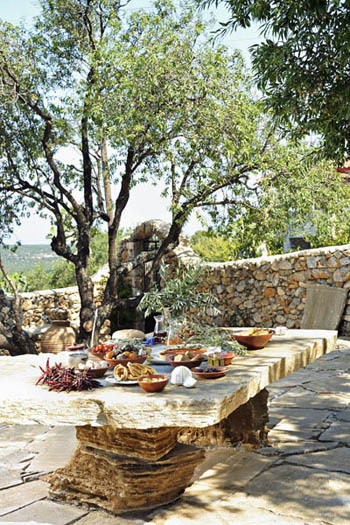 They also prepare their own olives and make wonderful jams – tomato and pumpkin marmalade are among their specialties. Breakfast was one of the best I ever had, but I was also very impressed by the cosy and stylish bedrooms and bathrooms, the wonderful terraces and welcoming atmosphere. 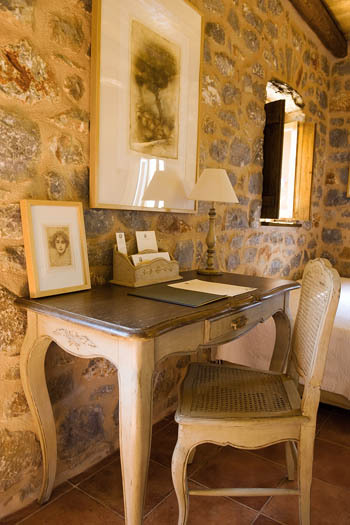 A very nice touch is the original artwork (lithographies by Miltos Pandelias and sculptures by Irini Gonou) in all the rooms. 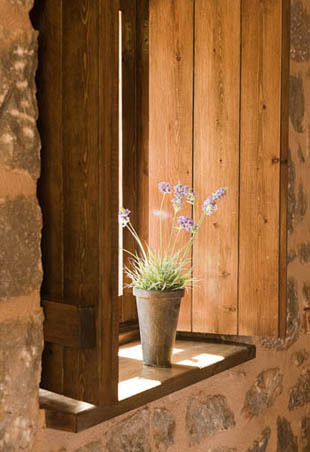 Due to the historical architecture of the buildings, the bedrooms have small windows and don’t get much natural light. The breakfast was one of the best I ever had! 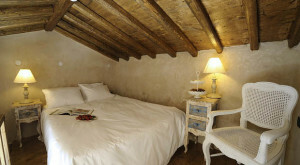 Citta dei Nicliani is a very romantic place to stay! 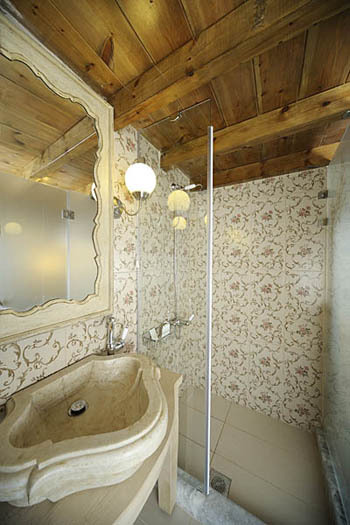 Prices for two persons from 80 Euro per night, breakfast and taxes included. 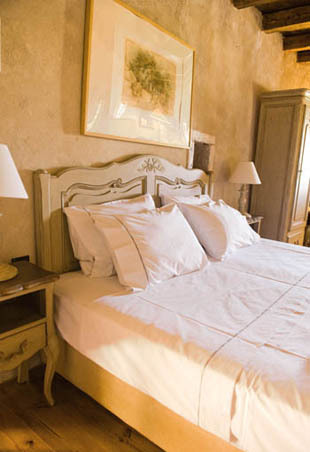 For a full overview of room rates, please check the website of Citta dei Nicliani or contact the family. Hotel Citta dei Nicliani has a small restaurant for hotel guests (Ilias cooks) serving salads, fish, risotto and a dish of the day. 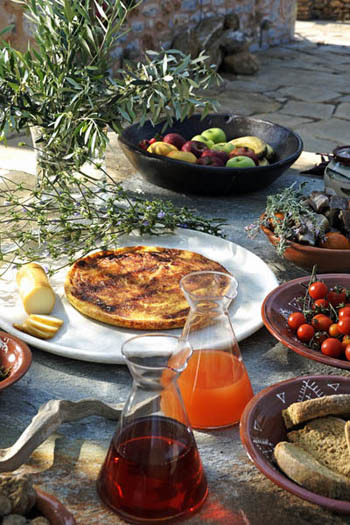 You will be asked at breakfast if you want to eat in at night, so Ilias has the day to prepare a wonderful meal with the freshest of ingredients. I had a delicious fresh salad and a wonderful porcini risotto. Breakfast the next morning was simply amazing. Tania brought me an omelette with wild asparagus, smoked ham cooked in wine, fried sage, yogurt with spoon sweets, fresh cheese with honey and local pastries. Definitely one of the best breakfasts I ever had! 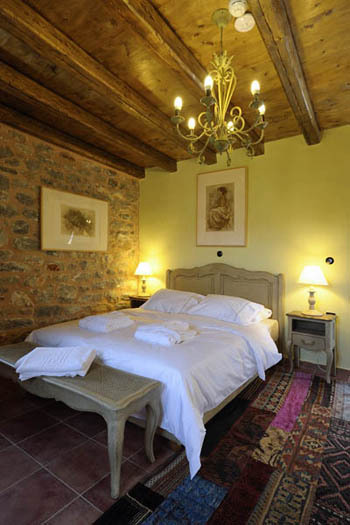 I would say Citta die Nicliani is more of a hotel for romantic escapes than for family holidays, but children are definitely welcome, and there are a few rooms that have an extra bed (a single or a double), so you can in principle share with one or, if they are young, two children. Mani is not a typical destination for beach holidays, there are several nice beaches about 15 minutes by car from the hotel (towards the south). 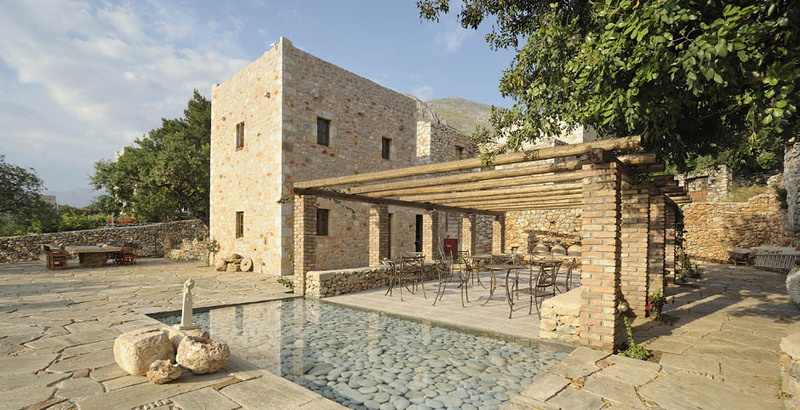 There are plenty of things to do with your children as well: explore Vathi and other stone tower villages, visit the caves of Pirgos Dirou (they are fantastic – my kids loved it!) and take them for walks. Go for a swim from the small but gorgeous (pebbly) Mezapos beaches (6 km away), or drive half an hour south to the two sandy beaches of Marmari. 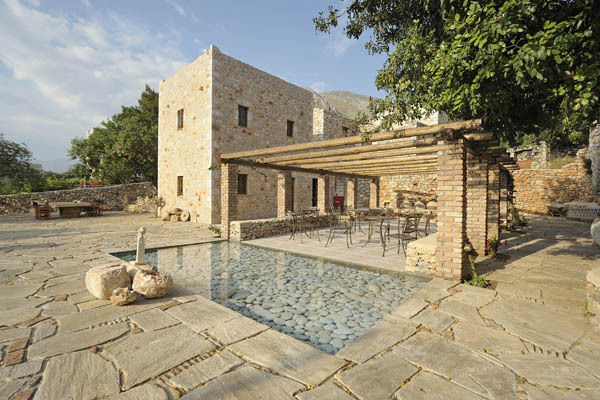 The first has a taverna and beach facilities; the second is ‘wild’ and quieter in the summer high season. There is a beautiful network of paths crisscrossing the Mani countryside and the family will happily suggest walking routes to take. 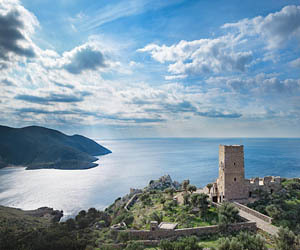 Be sure to do the walk from Kokkinogia to the lighthouse of Tainaron at the southernmost point of the Peloponnese (an hour’s walk to go and come back). If you ask well in advance, guided hikes can be arranged as well. Another beautiful way to explore the Mani is on horseback. There’s a riding club in Pyrgos Dirou (15 minutes by car) where you can sign up for full-day horse riding treks. 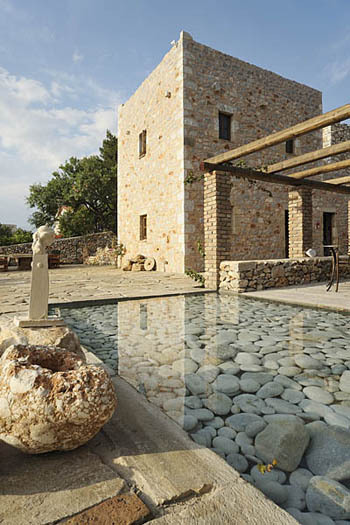 Panagiotis Sepsas is a wine connoisseur his cellar features over a hundred Greek wines vintages going back to 1944. Check out the wine list and discuss your interests with him for an unforgettable wine tasting experience. (I had a mini-tasting session, and even that was memorable!) 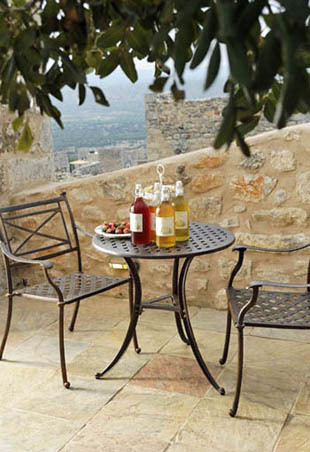 Visits to wineries in the Nemea region can be organized as a day excursion. 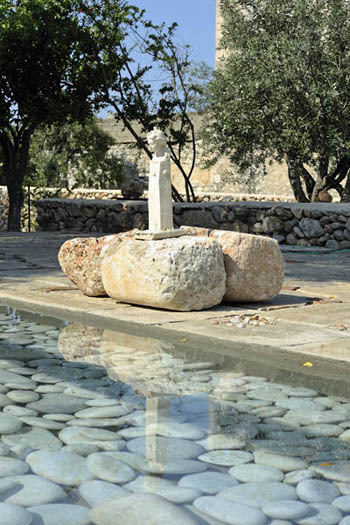 Come during the season the olives are harvested (from late October until early December) and visit the local olive oil press so see how the olives are cold pressed to produce top quality virgin olive oil. Visit the caves of Dirou, among the largest in the world. A guide will take you for a 1.5 km boat ride past amazing stalactites and stalagmites. Also pop into the small museum with exhibits from the Neolithic age (ceramics, tools, bone fragments, skulls…). 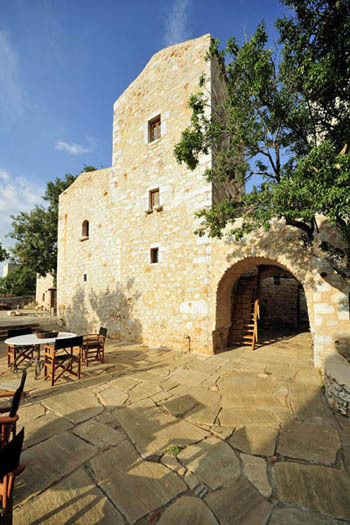 Stroll around the cobbled streets Vathia, one of the most beautiful tower-house villages of Mani. Go for lunch by the sea in Limeri, another one in Gerolimenas. Have dinner and drinks in Areopoli. Combine a swim in the sea with a meal at one of the fish tavernas of Porto Kagio. 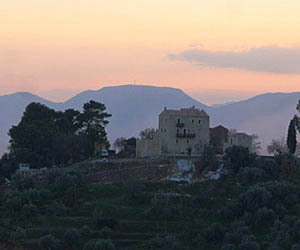 Citta dei Nicliani is in Koita, a small historical tower house village in Mani. The setting is rural, and it is very quiet. 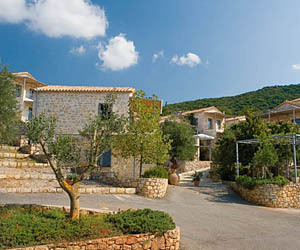 Koita is a few km from the coast; the little fishing port of Gerolimenas is 4 km away. There are some at beaches about 15 minutes’ drive away. 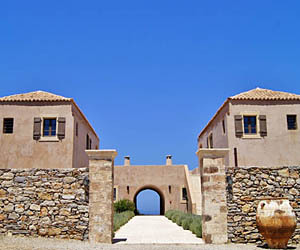 Southern Mani is about 300 km from Athens, but you should count about four hours for the drive. From Korinthos, follow signs for Tripoli, Sparta, Gythio, Aeropoli and Gerolimenas. 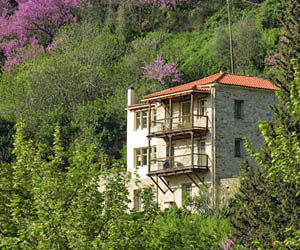 Koita is a few km before Gerolimenas. When you arrive in the village you will see a supermarket on your left. Turn left immediately and take the narrow road that goes uphill. At the T-junction, turn right and then left before the church. Leave your car after 50 m, at the sign for the hotel. A waterfront warehouse converted into an upscale hotel with beautiful rooms and suites, seafront terraces, a gorgeous swimming pool and gourmet food. 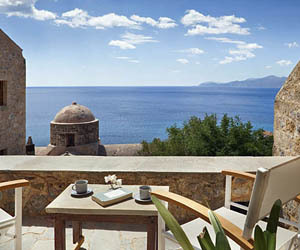 A romantic year-round holiday destination in Mani. 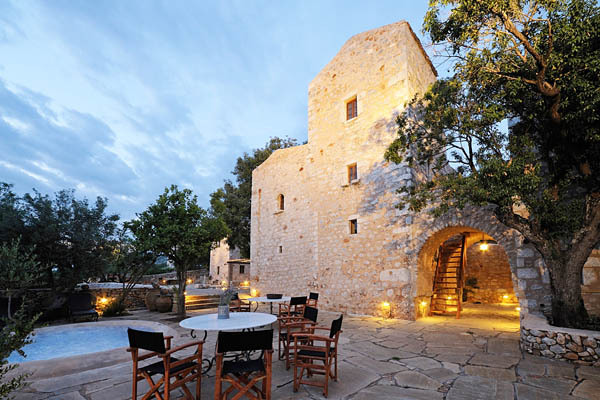 A centuries-old tower house in a beautiful setting in the Mani countryside, turned into a charming family-run hotel. 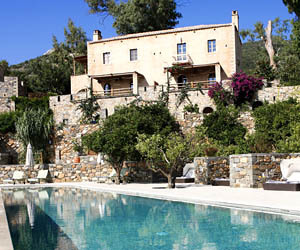 Inviting rooms and suites, delicious food, a great swimming pool and a super relaxed atmosphere. A reconstructed Byzantine house within the city walls of the Kastro of Monemvasia only steps from the sea. 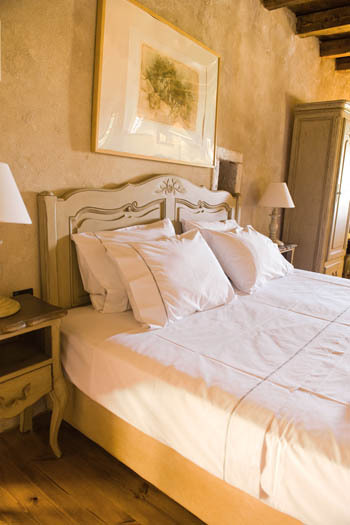 A charming hotel with cosy traditional bedrooms, elegant suites and inviting sitting rooms. 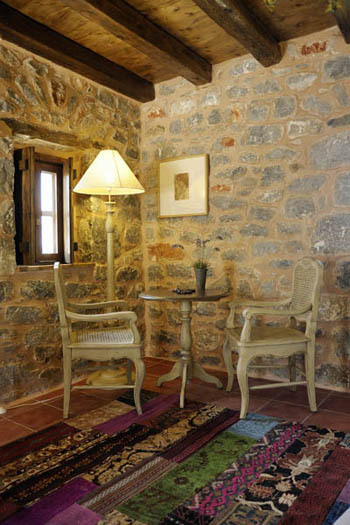 An early 19th century tower house in southern Mani converted by the architect owners into a beautiful little hotel. 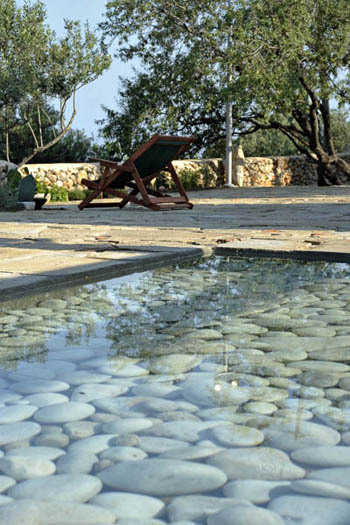 Come for walks, lazy afternoons by the pool, swims in the sea, excellent food and a warm welcome. 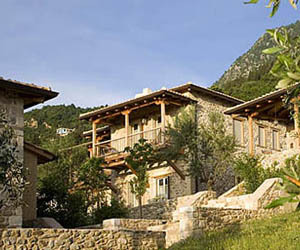 Eco-friendly little stone houses done in an unfussy, refreshing style. The setting is quiet; the atmosphere friendly, and the views over the sea and the coast of Kardamyli in Mani are stunning. 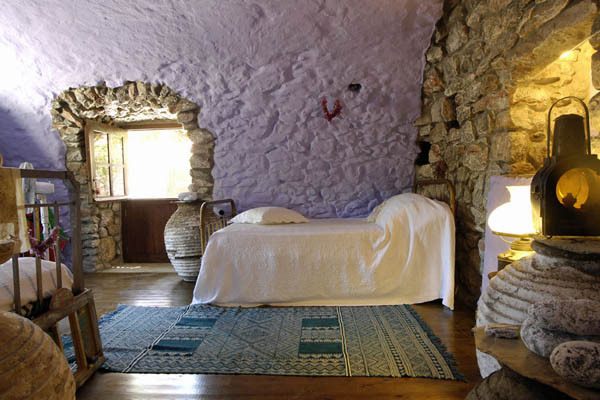 A gorgeous guesthouse on Kythira island, with four beautiful self-catering apartments, where you can come for relaxing or active holidays. The super friendly Dutch owners serve a great breakfast. 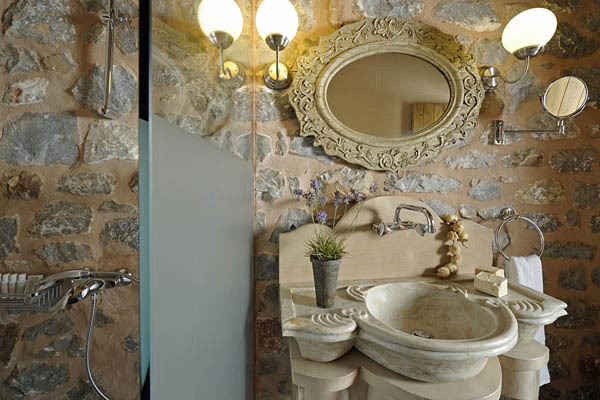 Enjoy the best Greek hospitality and wonderful home-cooked meals at this adorable guesthouse set in nature a few km from the remains of the Byzantine city of Mystras in the Peloponnese.